French side Lyon stunned Manchester City in the opening half hour of tonight’s Champions League encounter by taking the lead through frontman Maxwel Cornet. Manchester City poorly gave away possession to Lyon from their own half and Nabil Fekir – who was the subject of one of this summer’s biggest transfer saga’s played a clever one two before getting past City ace Kyle Walker. 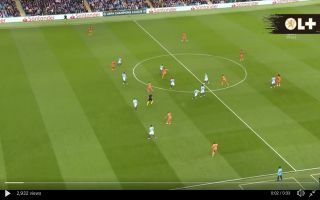 Fekir then delivered a hopeful low cross into the box which stand in City left-back Fabian Delph attempted to clear but instead Delph completely missed the ball leaving Cornet free to score behind him. England international, Delph could only hold his head in his hands after his costly error. Cornet was flagged offside for a goal only minutes before scoring the opener. City haven’t looked at the races so far and will need to significantly improve if they wish to come away with anything from their Champions League opener.